Manufacturer of a wide range of products which include single or multi meal tray sealer, meal tray machine 5 portion, meal tray sealer 8 portion and cup sealer. 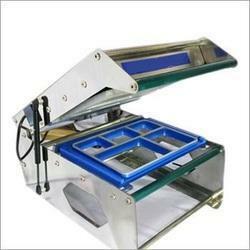 We provide Single or Multi-Meal Tray Sealer to the clients. Single Compartment Tray Sealer s are in compact size and lightweight. Single Compartment Tray Sealer with an excellent appearance, easy to operate change the mold. Human engineering quick sealing assures hygienic and dependable packaging. Single Compartment Tray Sealer is electricity saving, safety, durable and easy to clean. Various kinds of packaging materials containers can be applied in Single Compartment Tray Sealer. Single Compartment Tray Sealer is also suitable for the more deeper box. Single Compartment Tray Sealer is suitable for the packaging of refrigerating, seasoned food, microwave, moisture resistant carry-out food. Single Compartment Tray Sealers are very useful for restaurants, shops, supermarket, home factory. Providing you the best range of Cup And Tray Sealer such as Meal Tray Sealer, Cup Sealer, Single Cup Sealer, Round Cup Sealing Machine and Single Tray Sealer with effective & timely delivery. 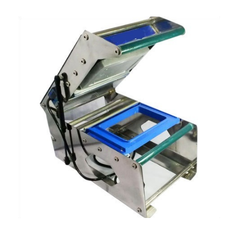 · Meal Tray Sealer s are in compact size and lightweight. 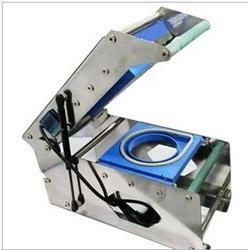 · Meal Tray Sealer with a excellent appearance, easy to operate & change the mold. · Human engineering quick sealing assures hygienic and dependable packaging. · Meal Tray Sealer are electricity saving, safety, durable and easy to clean. · Various kinds of packaging materials & containers can be applied in Single Compartment Tray Sealer. 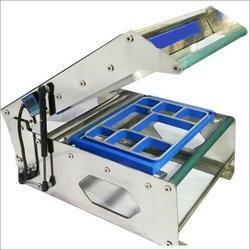 · Meal Tray Sealer are also suitable for more deeper box. · Meal Tray Sealer is suitable for the packaging of refrigerating, seasoned food, microwave, moisture resistant & carry-out food. · Meal Tray Sealers are very useful for restaurants, shops, supermarket, home & factory. Cup sealer can be tailor-made for sealing container in all kinds of shapes, including rotundity, bowl-shaped, rectangular, square, hexagonal and oval. Cup sealer is widely used in industries, such as medicine, food, beverage of pearl milk tea, bubble black tea,fruit, Soybean, Milk, Soup of lunch box, cup water etc. Looking for Food Packing Machine ?